This is a central-pillared cave with a flat ceiling at the back and a gable ceiling in the front (Figure 1). 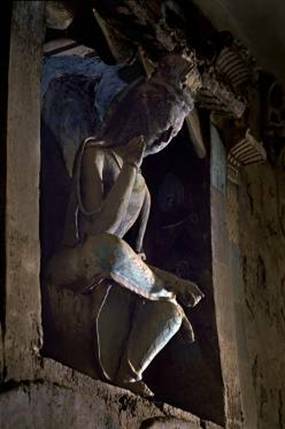 The Buddha in the niche at the front side of the pillar is the main statue of the cave. He is sitting with legs-pendent and his robe is draped with his right shoulder exposed. In the caves constructed in the Northern Dynasties, this style is the most popular for the main statue of the central pillar. The ceiling in the front portion of this cave is gabled and the back was flat. On the gable ceiling, imitation rafters were painted with lotus and palmette. Souls born from the lotus, birds such as peacocks and parrots, were painted in between the rafters to describe the scene of paradise (Figure 1, top). Smaller niches are in the three other sides of the pillar. In one of them is a seated Bodhisattva in a pensive pose (Figure 2), whose serene and contemplative look had greatly influenced artists as far away as Korea and Japan, and who built statues of cast metal, pottery and wood. 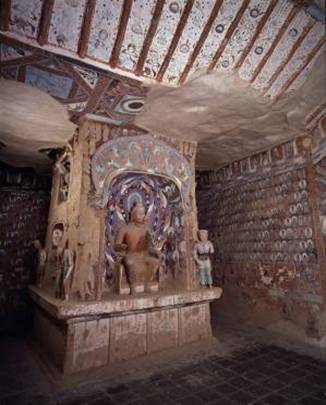 In Dunhuang, the distribution of narrative paintings in a horizontal band of multiple scenes was first adopted in this cave. The Ruru jataka (Figure 3) is a very well known story in Buddhism: a nine-coloured (as symbolic of rarity) Deer-King rescues a drowning man; however, the man leads the hunters to the deer’s hideout for a great reward from the king who intends to capture the deer for its precious horns and beautiful skin. But the king spares the deer when he learns about the betrayal of the ingrate. The man suffers from disease as a punishment. It is a very interesting and moving story, and the painting is a masterpiece. The episodes proceed from two sides towards the centre, where the climax of the story is depicted: the conversation between the king and the deer revealing the treacherous deed of the man (Figure 3, centre). This arrangement shows that a story is not necessarily depicted in a chronological sequence. Two other stories are also illustrated. The first is about Sumati (a rich Buddhist lady) inviting Buddha to her home to preach and show the superiority of Buddhism to her father-in-law and her husband who are Brahmins (followers of Hinduism). The other is about a novice who, while begging for food, is kept by a girl who wants to marry him. In the end, he commits suicide to keep his celibacy vows, a sacrifice for which he is worshipped. The former story shows the competition between Buddhists and the followers of other religions. The latter indicates that enlightenment can be reached by rejecting worldly sensual temptation. 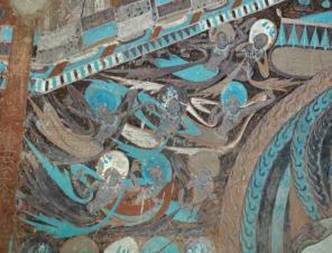 These murals share the characteristics of the Northern Wei style — the human figures are bold and rustic, dressed in Central Asian style; the background is reddish-brown; the colours were applied using the imported yun-ran technique; and the tone is strong and warm. Outside the main niche are many apsaras flying towards the image (Figure 4). Above is the balcony of the heaven, which is usually the motif along the top of walls in earlier caves. The balcony is painted with the yun-ran technique to show the three dimensional effects, while the architecture is painted in a foreign style. The apsaras, bending at right-angles, are quite stout while their bodies are as soft as the dancers.